Mary Naegeli, who blogs at Bringing the Word to Life, asked her readers: Did Jesus Die for the Sins of Humanity, Or Not? Ms. Naegeli is infamous as the one who keeps stalling the ordination of Lisa Larges through the Presbyterian court system. Since the right wing has had little luck stopping the tide of human decency, reason, and biblical and theological literacy regarding ordination equality, now they are up to their old tricks of trying to enforce theological purity. In the spirit of the fourth century they seek to impose their superstitions on the entire church. 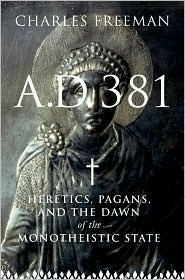 An excellent book by the way is A.D. 381: Heretics, Pagans, and the Dawn of the Monotheistic State, by Charles Freeman. The interesting and compelling thesis of this book is that the doctrine of the Trinity was forced upon the empire by Theodosius I. This put an end to freedom of thought. Enter the Dark Ages. So now we have a concrete example of our worst nightmare, when a presbytery fails to recognize a serious departure from the essentials of the Reformed faith. Coastal Carolina has determined that “Jesus died on the cross for our sins” is not an essential of our faith. All I can say at this point is, “Thanks for nothing. You failed to act according to your responsibilities: to ‘provide that the Word of God may be truly preached and heard’ and to ‘nurture the covenant community of disciples of Christ . . . [by] warning and bearing witness against error in doctrine and immorality in practice within its bounds’ (Book of Order, G-3.0301a,c). This is a serious irregularity that leads only to confusion, disunity, and pastoral fraud. When the church perpetrates such a hoax, it is denying our church members that which the PCUSA promises to deliver: the proclamation of the gospel for the salvation of humankind; the shelter, nurture, and spiritual fellowship of the children of God; and preservation of the truth. Same old trick. Browbeat people into submission with dogma. Ms. Naegeli and the right wing of the church are not interested in truth. They are interested in power. They wish to enforce their narrow and pitifully dated theology on the entire church. I wonder if these blog posts from her and others on the rabid right are testing the waters for heresy trials? Here is my answer to Ms. Naegeli's question, Did Jesus Die for the Sins of Humanity, or Not? Jesus was executed like thousands of others as a perceived threat to the Roman Empire. Some, and I emphasize some of his followers attempted to find meaning in his death and many theological explanations were offered including the perverse notion that God the Father sent him to die in order to satisfy the Father's honor and to save you from hell. It doesn't even make sense. Adam and Eve supposedly sinned in the garden and as punishment all their descendents are infused with a shot of original sin. Since God the Father needs to have his honor restored (talk about patriarchal nonsense) he kills his Son (who in the weird Trinitarian formula is really the same guy, sort of) so that everyone on planet Earth doesn't spend eternity in hell. If anyone takes twenty minutes thinking this through they can see that the whole structure is absurd. Beginning with the fact that Adam and Eve never existed. This is an entirely imaginary scenario invented by the first through fourth century mind. It is theological fantasy. The only reason it still exists is because of force and guilt. The goal is to keep people childish. The respective reward and punishment of heaven and hell and the guilt that plays on our individual psychologies and need for acceptance keeps this nonsense going. If you want to see this psychological and spiritual abuse in action visit one of the "Judgement Houses" we have in our area. They are operating at full speed during the Halloween season. Gotta love that irony. Even as absurd as the "Jesus died for our sins" notion is, it has been successful at claiming to be the right and only way to understand Jesus. That is why religious literacy is so important and why we do our little part to bring it to our neck of the woods. Do join us if you can for our Jesus Seminar on the Road, this weekend, October 21-22. We examine the historical person of Jesus. Who was he before he was bitten by Christian dogma and what might he be for us today? Here is the information. Full-time students with ID get in free. I have enjoyed reading your blog, but today i decided that it was important to comment. I too am a Presbyterian minister, and it is in this blog where we see how thoroughly diverse our wonderful denomination is. Please know that I enjoy laughing with your writings, and I hope to continue to do that. I will be upfront and say that i do not support all of what Mrs. Naegli is doing and saying, and I have been vocal about that with her. Since that is the case, I feel that it is just as important that I be upfront with you as well. I hope it will open dialogue and move to bridge the Theological gap seemingly between us. In this blog, you have shown complete disregard for studious examination of thought before claiming something as fact - rather than opinion. You claim that "Beginning with the fact that Adam and Eve never existed. This is an entirely imaginary scenario invented by the first through fourth century mind. It is theological fantasy." This is just a plain false statement. The Jewish Torah has referenced Adam and Eve and the story of Eve's defiance from as early as 1220 BCE. Not all Jewish Rabbi's agreed with the notion of Original Sin, but to say that this story is a 1st-4th century invention is utterly ignorant. Maybe you should read some of the ancient texts by Jewish Rabbis, or maybe pick up Jewish Literacy by Rabbi Telushkin. Also, I am supposing that you read Freeman's books - both the one you reference and The Closing of the Western Mind. If so, maybe you can explain why Freeman does not compare and contrast other examples of emperors like Arian and Chalcedeon emperors not being able to do what he claims Theodosius does? I would argue it could be because the ideals, theological stances, and Nicene doctrine were already widely accepted as Orthodox. Freeman avoids this thought because it does not make for as controversial of writing that he is known for. The idea of Blogs is wonderful as it allows us to connect our thoughts and ideas to the rest of the world. But what it lacks is factual guarantees, as we find in your most recent critique/entry. I would love to hear your thoughts on why you would avoid thousands of years of Jewish tradition to make a broad and pointed criticism? Hey Rob, thanks for the comment. I am not sure I am understanding your criticism regarding Adam and Eve. I am saying that the theology that Jesus died for sins to save the world was invented between the first and fourth centuries. How could it predate Jesus? That Adam and Eve never existed is pretty much a fact even though we have assumed they were historical figures until fairly recently. Kudos to Mary N. for continuing to speak the truth of Scripture in a denomination where many of its leaders have lost their way theologically and biblically. Well done. What if the church had emphasized the first creation story rather than the second? Men and women were created at the same moment and all creation was declared good. Original blessing versus original sin (Matthew Fox). I have been reading several books recently by Quaker Phillip Gulley. "If the Church Were Christian" and "If Grace is True" (with )James Mulholland which offer similar viewpoints. Gulley received blowback from some of his Quaker colleagues who are considered more open and liberal than our own denominations. Where can I find that kind of time to waste? Seriously, I'd love to know how the busybodies, fusspots, tattletales and scolds find the time to get their knickers in a twist over something that happened thousands of miles away, in a church they will never attend, to a MoWS they will never meet. As someone who actually works for a living it is truly remarkable how people of leasure (I assume they don't have to work) have the luxury of spending so much time meddling in other people's business. I find it interesting that conservatives think that something that was written 2000 or 3000 years ago was the last word for all time; cannot be critically examined; cannot be re-conceived. This self-destruction of critical or creative thought is why I think conservatives will eventually become economically marginalized, the blue-collar workers of the future high-tech empire run by China, India, and modern Westerners. @Michael, that is exactly right. Is the church secure enough to talk openly and change? Are we about freedom of thought or believing the same nonsense just because you can find verses in the Bible that seem to support your fantasies? Again, this is about power not truth as evidenced by three of eight comments so far challenging my ministerial credentials because I wrote this post. The original post was about those who are busy making sure we boot out any minister who exercises freedom of thought. Power and control versus the honest open search for truth. I choose option two. Thank you for the response. I misread your blog, assuming something since you are a PCUSA Teaching Elder. I assumed that you were saying that you discount the age-old teaching that sin entered the world through the defiance of Eve in the Garden of Eden. Once I read it again with your comments, it is clear to see that you are relating that to the idea of Jesus dying for sins to save the world as a concept which began sometime between the 1st and 4th century. I am sorry for the undue critique with regard to that. The reason that I assumed it as what you were saying is that since you are a Teaching Elder, that you had to answer the same questions of Ordination as I did (from the Book of Order's Directory of Worship). And if you did answer those honestly, then it is hard for me to imagine that someone who affirmatively responded to the question that says, "Do you accept the Scriptures of the Old and New Testament to be, by the Holy Spirit, the unique and authoritative witness to Jesus Christ in the church universal and God's word to you?" could then argue against what Scripture says concerning Christ's atoning sacrifice for the sin which entered the world with Adam and Eve. I would say that I disagree with you as to the invented part. Since Jesus was living in the 1st century, and the disciples were writing their memoirs (as Justin Martyr calls them) during that time, we know through papyrus that well before 140 AD the Gospels and 10 Epistles were being circulated. Those Gospels and Epistles circulated were sharing the theory of Atonement we are referencing (you as made-up, me as not). Not one of those epistles as referenced by Marcion in 140 present a differing idea. Unless you are a neo-gnostic, it is hard to argue that there were other theories present and circulated which did not line up with the theory of substitutionary atonement. But with more and more papyrus being translated, even from as far as Egypt, dating to early 2nd century copies of gospels and epistles, it is not likely that this was a disputed understanding, or one "made-up" by the disciples. It seems that you are theorizing like Freeman does, without comparing and contrasting the real historical evidence. Maybe you could share insight on that part of my original critique. The second part of your follow-up is interesting. "That Adam and Eve never existed is pretty much a fact even though we have assumed they were historical figures until fairly recently." First, something can't be pretty much fact and be accepted. It is either fact or it is not. And the usual process and rule for discovery (which again Freeman seems to do an end around)is that the closer a document is to the original date of the event, the more likely it is to be accurate historically. The farther it is from the original date, the less likely it is to be historically accurate. I understand that there are some modern scholars who are trying to argue that Adam and Eve were not historical figures, but with all of the writings of Jewish Rabbinical law and commentaries, we have to assume that the earlier documents are fact, and that the more recent writings are just theories unless there is overwhelming evidence to the contrary. There has been no hard evidence offered from ancient documents to discount the Jewish understanding that they were historical figures. Therefore, no matter how much we desire to be right with our modern theories, until it is disproved, the older documents still carry the day. Good Lord, Rob, you think Adam and Eve really existed? My friend, Snad, would call this interaction we are having trying to jump the Grand Canyon on a tricycle. It ain't gonna happen. As wide as you might think our differences are, they are wider. We can debate fairly successfully that the paradigms within the Bible are illogical. But what is the point of playing any role within the religious structures of the Bible, if you deny those paradigms? It's hypocritical to play church but not embrace its tenets. @Kevin I am not interested in dealing in antiquities in a self-made dogmatic grotto. If the tenets are no longer true, they should be changed. it seems clear that you are not interested in engaging in conversation, but are only interested in people supporting your "right view". I will leave you to the ear wagging you are searching for from other progressives. I will leave you to the victim mentality that I see running through your comments throughout your site - BTW I did not challenge your ordination. I in fact shared why my assumption led me to read your blog incorrectly the first time...and I openly apologized for allowing that assumption to mislead me. I also never said that I believe Adam and Eve are historical figures. What I said is that something can not be "pretty much fact." that is not fact. I also sought to explain the rule of critique when trying to discover the truth - with regard to an interpretation of history...the standard is that the older texts carry the day, unless there is overwhelming evidence to prove it false. But, again, you don't want to look at that and discuss it. I will leave you with the tricycle and I will stick with what OUR constitution calls the Great Ends of the Church - including Preservation of the Truth. What do you mean by "older texts" when it comes to Adam and Eve? The archeological evidence is that modern human beings are somewhere between 100 thousand years old to 200 thousand years old. The old texts you refer to are 2 thousand to 3 thousand years old tops. The difference between a modern text and the oldest texts we have is about 1 to 3 percent. Hardly significant from the point of view of precedence. The oldest texts we have are no closer to the time of the events than the most recent texts. They are all basically contemporary. I think the real question is whether the PCUSA is a club. Specifically a club of people who believe a set of beliefs put forth in a set of confessions that presume to interpret the bible correctly. If it is, AND you do not agree to the terms and conditions of membership in the club, then of course you should not be a member. If the right wing would hold their argument to this standard, they might have a case. But when they extend the argument to "oh, and by the way, we are talking about absolute Truth with a capital T", they shoot themselves in the foot. Nobody can prove that Jesus died for ours sins. Every argument for that belief starts with a subjective impression of reality that rests on personal feelings and subjective religious experience. Viola made it even worse on her blog by asking "was it necessary?" Who the blippity blip blip can know that??? But if it happened then it happened. "Necessary"??? I loose interest when people impose arbitrary subjective feelings on the nature of the Universe and tell it to be This-that-and-the-other because the Bible ordains it. Might as well get a frontal lobotomy. It might as well be all myth and supersticion. "pretty much fact" is a figure of speech. Fact, ok? Literary characters, fictional mythical characters, fairy tale characters. What have you. Adam and Eve are made up characters in a story. OK? Genesis is a fiction. People thought it was true for a long time, well in to the 19th century, and obviously, many still do today. But now we know things like the evolution of species and the age of Earth, even the universe. "God" didn't inspire or write the book, he is a literary character in the book. Everything is different. The Bible tells a small story. It is a collection of writings that has formed the basis of Western culture, to be sure. Western culture is dominant for now. But in and of itself, it is no more than a tiny slice of reality compared to our Universe story. It is no more comprehensive than the myths of other cultures, just more dominant. The entire scheme of original sin and atonement is no longer even interesting. It is like alchemy or something. It is an outdated myth in a new universe. The right wing holds desperately on to a passing fairy tale. How much damage they will do to "preserve their truth" is the question that remains. Exactly. Is the PCUSA a club with a set of beliefs or is it place that explores truth and goodness? That is the struggle really. What will the PCUSA become? Oh Jodie, do me a favor and don't mention what's her name anymore. Hey, folks. I'm enjoying these comments - and love that you can make use of the bicycle analogy, John. I have a question for all of you, though. And I'm not asking it to hear how it measures up to ordination standards, what anyone swore an oath to in order to get a paycheck, or any of that. And I'm not asking it to hear how it will be the salvation or damnation of my eternal soul. I'm asking as someone who finds herself sitting in the pews once a week or so and then living the other 166 hours or so a trying to put Jesus' teachings to good use. What difference does it make if I believe that Jesus died for sins of the world? If, as I am led to understand, nothing I do can bring me to be cast out of God's favor and nothing I do can secure that favor without God's wanting it, what difference does it make? Like John said, it sounds to me like just another secret handshake or password at the door to remember that will get you into some man-made social club. Jodie writes, "If it is, AND you do not agree to the terms and conditions of membership in the club, then of course you should not be a member." That's fine, Jodie, if one assumes that it is John who is breaking the rules. And if one assumes that the busybodies, fusspots, tattletales, and scolds aren't simply lying about the rules. But you see, we Presbyterians have already been down this road when the Fundamentalists tried to take over the denomination in the early 20th Century. They lost. And because of that, our club does not have a list of 5 Fundamentals one must sign on to in order to be a member. Fast forward 100 years, and the Fundies are at it again -- having either forgotten or never known the lesson they were taught before -- trying to first, change the club rules without a vote, and second, to force everyone to subscribe to those rules, which is actually also against the rules. I'm not sure which denomination those yahoos thought they were joining, but I'm pretty sure the Catholic Church would feel more at home to them, given their views of church polity and ordination. They may as well actually have a real live pope instead of their continuing to try to consecrate our Book of Order as their own pope. Rob, I am amazed that you are a Presbyterian minister and yet appear ignorant about material that is learned in a basic Old Testament 101 course. How can you claim to have graduated from college and/or seminary and not have covered this? This is pretty basic stuff, especially for introductory church history and biblical criticism courses. Or maybe you went to Gordon-Conwell. Alen said "I'm not sure which denomination those yahoos thought they were joining, but I'm pretty sure the Catholic Church would feel more at home to them, given their views of church polity and ordination. " I have noticed a) a fair amount of practical belief that things like marriage and ordination are sacraments, thus better suited to the Roman Catholic Church - along with a desire for centralized authority and such. And b) I have indeed run into what would seem like a statistically anomalous number of Roman Catholics who are ex-Presbyterian. These have in general been people who embrace systematic doctrine and like being told what to believe. For some that is a comfort. Me, I like the freedom to explore and change my mind. Systematic doctrine is much too mechanistic for my taste. The Universe is much more complex and wonderful than that, and if God did indeed create the Universe, then from his handiwork I would say all bets are off when it comes to doctrinal knowledge of Truth. God's Truth just goes on for ever and ever in all directions. If God IS, and God became a human being, the implications are infinitely greater than what our little narcissistic theologies of atonement can possibly fathom. wow, John! you hit a nerve!! funny how Jesus preached the "gospel=good news" and NONE of it included Jesus 'dying for the sins of world'. His 'original' good news was that God was God, who created us in love and sustains us, in good times and bad, with more love! (and several other 'gifts of the spirit'). This Sunday's lectionary reading sums it up: Matt: 22: The greatest commandments: Love God, love your neighbor! THAT's the good news and if Christians proclaimed that instead of dogma purity, we WOULD be saved from a lot of conflict! i'm past-ready for that in the church and in the world. Thanks for creating space for dialog, John! Fascinating to read the comments--which perfectly illustrate the divide in the PCUSA. I can't make myself fight any longer. But the fight obviously will continue. If the "Jesus Did NOT Die for the Sins of Humanity" continues to gain traction I guess I will have to go searching for an arm of the church where I can serve without my fingers crossed. See, that's the problem right there. You try to theologize, and right away someone says you want to fight. Heck, someone starts fighting. I am pretty sure the Gospel is not about fighting every time someone says they don't get or don't accept some church doctrine or other. The Gospel in NOT about orthodoxy. Don't get me wrong, this post is by definition under the category of right thinking. But the right thought is that right thinking is not where the action is. I've always wondered what scriptures Paul was referring to when he said "Christ died for our sins according to the Scriptures". I don't mind engaging in trying to work out what makes sense "right thinking". I may be wrong and I change my mind. therefore...one of us has to leave or I need to purify the holy church from the likes of you. That attitude keeps the church in the dark ages, never allowing it to flourish from the benefit of free thought. Free thought does not mean every thought is going to be good. But for something that could be good to take root, free thought must be allowed to flourish, and this should especially be true among our ordained leaders. We should not make them take vows to make their thinking more narrow but the opposite. Maybe whatever Paul meant by that was fine for him in his time. He was a guy who had opinions. He had differing opinions about the same topic. I can respect them but I am not beholden to them. Maybe there is some nuanced metaphorical, mythological, psychological sense in which "Christ died for our sins" has truth in some way. If it works for you, I'll live and let live. I am sorry, but I missed how the reference in Galatians tells me what scriptures Paul is talking about in 1 Cor 15:3. Can you help me out with that? Look, I am not arguing the case for or against the doctrine that Jesus died for our sin. He died. He lives. I know him. I study his teachings and his life and I try to learn from him always. And I study Paul and his life and teachings as well. I feel I know him pretty well too, although I don't go to him in prayer like I do with Jesus. He too saw the infinite reality of God and what he did in Jesus. That he found words to explain Him to his contemporaries reflects his genius. But sometimes I think it's a mistake to force Paul's archaic cosmology on 21st century Americans purely for for the purpose of trying to make him make sense. Perhaps we should try to see what he saw, and then we could come up with our own words to explain it within our own cosmology. I think he would encourage us to do precisely that. And perhaps if we did we could tap into the power of the Gospel to transform the world WE live in, just as Paul taped into it to transform the world HE lived in. Perhaps. Either way, my question was in place and time. What scriptures do you suppose he was talking about? I used the word "fight" advisedly. In this comment stream--as at Presbytery meetings--SOME of the progressives use contemptuous language, attempt provocation, and engage in other behaviors that I would characterize as conflictual. Meanwhile, the more conservative folk speak and write respectfully. Plus, can anyone honestly deny that we are engaging in a struggle for the future direction of the PCUSA? My previous post referenced an irenic decision on my part. But I have chosen not to engage in this fight. I refer not to theological debates as fights, but to the manner in which SOME of the progressives conduct themselves as they press their causes. I find that once I do my best to serve my congregation I have no spiritual energy left over for participating in "debates" conducted in such nasty ways. Please do not twist my words in the attempt to make me look like a bad guy. I probably should not have participated in this forum. It has already gone down the same path as most other discussions in the PCUSA and I really don't want to fight. I'll read what y'all have to say for a couple of days then check out. That way, you can have a word on me if you like. Upon him was the punishment that made us whole, and by his bruises were are healed." (Isaiah 53:5). "In Christ all the fullness of God was pleased to dwell, and through Christ God reconciles all things, whether on earth or in heaven, making peace by the blood of the cross (Col. 1:19-20)"
This language (which was in the old Form of Government as well) was just debated by the whole church and voted into place as a key conviction that is central to our faith. It is not some weird, foreign idea forced upon the church by power-hungry conservatives as you and others claim. It is a central understanding of the Christian landscape from day one. What you seem to be missing is that the PCUSA and its predecessor bodies presented itself as holding this truth, all other affirmations in the Book of Order and Book of Confessions, and the Holy Scriptures as "our only rule of faith and manners," as the content of the Christian faith, and offered them as a social contract to those who would join as members and serve as officers and ministers. All conservatives are asking of the church is to honor its side of that contract. We are deeply offended that you and other progressives seem to want to blow up the contract midstream and alter the apostolic content of the faith. Likewise, you seem to pitch a fit that we dare to hold the church accountable to its end of the deal. This is not a power-grab. It is spiritual stewardship and mutual accountability within the body of Christ. It is our duty as ordained officers who share responsbility for the life and health of the whole church. Please do not disparage traditional believers, their convictions, or their biblical world view. We find life and joy in them, and believe your pathway is a spiritual dead end. We voice our concern out of love for you and all of God's people, whether you choose to receive it that way or not. This line, which follows a prediction of His passion, is clearly substitutionary in nature. It also follows two other passion predictions in Mark 8 & 9. These passages are likewise at the root of the healthy portion of the progressive viewpoint in Christian theology and ethics. Even more, since most scholars accept Mark as the earliest Gospel, written between 62 to 70 A.D., it shows that this view of Christ’s death was not some later fabrication or addition. I don't know who got down in the mud first, but over the last forty years the Layman has made it impossible for the right wing conservatives to claim the high road. If you sound like a Laymanite and don't get treated with contempt, it's a blessing. Disappointed you didn't listen. 1) You got John and me mixed up. 2) You are dissing me. And I was being open, honest, and courteous with you, as I always have been. What I draw from your last post is that you will not let John's post stand on its own tonight, but you will project onto it your own message before you listen to his. Why bother? Just present your own message. I hope and pray it's full of grace and peace from God our Father and the lord Jesus Christ. Stushie wrote, "You were definitely arguing against one of the most essential tenets of the Reformation and bedrock of Presbyterianism, no matter which century we live in." And Stushie believes in vows of celibacy for those who are ordained. Nothing Reformed nor Protestant in that. Someone back there wrote, "Meanwhile, the more conservative folk speak and write respectfully. " However, I do agree that there's no need for a fight. That is, as John has pointed out, the genius of our polity. If people would learn the lesson their parents unfortunately never taught them -- to mind their own business -- there'd be no reason for these fights. Anyone here, with the exception of his own parishioners (who don't seem to mind), who cares what John has to say simply has too much time on their hands and should learn to MYOB, as Ann Landers would have said. No one can read this thread, with the many veiled and not-so-veiled threats to John's career and write anything about so-called "respectful" conservatives and expect to be taken seriously. "As for the celibacy remark, I guess that's a tangent of someone else's own making." Nice dodge. Actually, no... rather poorly executed and obvious dodge. Actually the topic here is about the phony orthodoxy of the radical fundamentalists in our denomination (of which you are one) and how they wish to hold everyone's conscience captive. I'm simply pointing out their bizarre need to criticize complete strangers while not being honest about their own multitude of departures from traditional, Reformed, Protestant, and Presbyterian beliefs -- such as your desire to return to Catholic vows of celibacy, or the weird notion stated above that a minister can "lead people to hell", or the notion that we have a list of fundamentals to which we must all subscribe. So, not a tangent at all. But then, as the phony orthodox and fake Christians on the right believe themselves to be without sin, I'm not surprised you don't see the connection. I always thought of Is 53:5 the way you said till a Rabbi friend of mine explained that before we Christians projected our beliefs about Jesus upon that passage, it was understood to be speaking of the nation of Israel. And I think even of Jacob himself, as he was renamed Israel after being bruised by God. Its something of which we need to be mindful, I think. Not sure what you meant there but as far as your elders thinking for themselves, that all depends on your recruiting methods. Do you encourage free thinking in your congregation? Do you recruit those free thinkers on to Session? Jodie, I wrote that in this comment stream and in my Presbytery the more conservative folk conduct themselves respectfully, and I do seriously claim that. Your painting me with the broad brush ("Laymanite") is precisely what I mean. I suppose I should thank you for making it so easy, but I genuinely take no satisfaction from it. Now, if you're going to look me up, please spell my last name properly, and please do us the courtesy of posting more complete profile information of your own. I have no fight with any of you. I disagree with the attempt to enforce a narrow theological agenda on the entire church. I think it is the wrong direction. I say so. Did not mean to misspell your name. But I have no idea which one you are. I was not painting you with a broad brush. I was just saying that the Laymanites have made it impossible for you to be a conservative without being identified with the likes of the Layman and its methods. And, as a consequence, rather than taking offense at the liberals who might lash out at you, you should take it as a blessing when they don't. You may feel like an innocent bystander, but you are walking into a hot zone. And you can trace the vernacular in the press. It's the Fundamentalists who first called it a "war" against those who would claim the right to free thought. In my case, I keep trying to theologize, but I keep getting called all sorts of bad names by the conservatives. If that doesn't happen in your neck of the woods, I would also consider that a blessing and I'd love to come join you. The fact that we're a denomination is no excuse to be meddlesome. I've heard this same excuse a number of times from a number of people and I'm still not convinced. It is a cute rationalization to defend one's desire to stick one's nose in other people's business, but it isn't actually the point of denominationalism. And if that's what denominationalism about, it's a pretty mean and petty thing then isn't it? Seems like this enterprise ought to be about something more than getting permission to be a nuisance and busybody. If the people closest to a Pastor, his/her Session, then his/her congregation, and his/her presbytery -- that is, the people who actually KNOW him/her -- don't have a problem, I find it simply impossible to believe that a complete stranger, who will never meet the person, who will never attend their church, who will never KNOW the person should have any concern. That is why, for example, you wouldn't find me filing charges against someone who I believe is not a Christian, like Stushie, or SWMNBN, or others. While I disagree with them on any number of topics, and while I've seen no evidence that they're Christians (and if they are Christian, they're certainly neither Reformed nor Protestant), it turns out that it isn't actually any of my business. I don't agree with John on any number of topics either, but that's not my problem either. But let's say that you're right; that it is your job to meddle into the lives of complete strangers. If that's the case, and John really is the horrible heretic you folks believe, if he really is "leading people to hell" as some of you have claimed herein, and yet the only thing you do about this awful heretic is whine on his blog then it is clear that you are not actually upholding the vows you claim to support. That is, your rhetoric is not backed up by your actions, so why would I believe your rhetoric? In point of fact, I don't believe your rhetoric, for precisely that reason. Stushie, SWMNBN, etc., etc., etc., have been getting their knickers in a twist about poor ol' John for years now. They love to complain, they love the attention it gets them from their peanut gallery of ditto-heads. And that's it. They whine and complain. Then they come over here and try to play the victim while simultaneously threatening the man's career. In any event, though we disagree about the reasons for denominationalism and what constitutes upholding ordination vows, I'm glad to see we agree that this whole thing has happened before. I appreciate that you agree with me that the fundamentalists lost that battle a century ago and as a result, we do not have a list of 5 Fundamentals which we're required to worship in order to be Presbyterian. As you wrote, "A list of five was placed in the book. It was taken out..."
Relevant wrote... "then why did the denomination have to vote on things this year like change in ordination standards or new form of government"
Anyway, excellent question! We had to vote to get rid of the unReformed, and unPresbyterian, and unChristian standards placed in the BoO by the very people who, as I have already argued, did not understand our polity. We remedied the situation and returned to Presbyterian polity. Thank you for an excellent example that displays exactly what I am talking about! Nothing about my approach suggests Congregationalism, having born and raised in a Congregational church myself, I'd wager know them better than you. No where have I said people cannot be busybodies, fusspots, tattletales and scolds. Nor have I suggested that there may not be appropriate times for one complete stranger to file charges against another in the PCUSA. Yes, freedom in the PCUSA means freedom to be twits, that's true. However, I'm arguing whether that's actually a good use of one's time. You say it is. OK, obviously I disagree, but that doesn't make me a Congregationalist. Perhaps it is you who could practice reading a bit. All you have done is make the argument that denominationalism is an excuse for meddlesome busybodies, fusspots, tattletales and scolds to whine on a blog about a complete stranger. I, on the other hand, think denominations should be for more than that. P.P.S BTW, "relevant". Care to provide your name, as I have? I find it rather hilarious that all these self-styled defenders of the faith have to hide behind pseudonyms. As I have written previously, I have turned a new leaf. Part of that leaf-turning is that I am done with putting up with trolls such as Relevant Rob. This comment section is my living room. You and others have thrown up on my sofa. I'm a tolerant guy. When you mention my executive presbyter, threaten my career, you and your kin are finished here. While fun, I am deleting the comments from the trolls. For those who responded to the trolls, you can choose whether to leave your comment up or not. How can you say Jesus did not die for the sins of the world when that is a central theme that runs throughout the New Testament? Because the NT contains layers of theology. They were trying to figure things out, just as we are. It no longer makes sense to more and more people. Isaiah had no inkling of Jesus. That is later read back onto Isaiah. In the same way, we read Anselm back on to the NT. What you seem to be missing is that the PCUSA and its predecessor bodies presented itself as holding this truth, all other affirmations in the Book of Order and Book of Confessions, and the Holy Scriptures as "our only rule of faith and manners," as the content of the Christian faith, and offered them as a social contract to those who would join as members and serve as officers and ministers. All conservatives are asking of the church is to honor its side of that contract. We are deeply offended that you and other progressives seem to want to blow up the contract midstream and alter the apostolic content of the faith. Sorry, Mike, it doesn't work like that. Things change. We change our theologies and we always have. The "contract" is to do so as democratically as possible. Likewise, you seem to pitch a fit that we dare to hold the church accountable to its end of the deal. This is not a power-grab. It is spiritual stewardship and mutual accountability within the body of Christ. It is our duty as ordained officers who share responsbility for the life and health of the whole church. I am not "pitching a fit." That would be the person I was writing about who continually uses the court system to hassle my friends and colleagues. Just because you think you right, it doesn't mean you are. Just because you think you have the Bible and apostolic witness and whatever on your side, that does not mean you do nor does that give you a free pass to hassle people who disagree with you. The changes that have happened in our church have happened because enough minds have changed to vote in the changes. That is the contract. I don't care how much you "love" me. I am not taking people to church court because I disagree with their theology. Your side is. It is a power grab, Mike. And it is ugly. Thank you for that question. That is big question. It is worthy of a long answer, but to say something now, I can say a couple of things. I don't think the first thing to say about humanity is that it is sinful. The first thing I say is that it is amazing to exist. Original Blessing not Original Sin. I don't use the word sin very often. It is because it has too much baggage. Images of a supernatural being punishing people, sending people to hell for their sins. I no longer find the word particularly helpful in describing the human condition. But there is a dark side to existence. Separation, alienation, and injustice. We hurt others, creation, and ourselves. Whatever sin is it seems to be social as well as personal. If the entire Jesus mythos (not just his death but the whole of his story) is atoning, healing, enlightening, and liberating it is in the present tense and ongoing. We weave or spiral through all of them. The Jesus mythos is connected with all four paths. I would be interested to know if your church serves Communion. If so, what meaning to you attach to it? "Understand the sharing of bread and wine in Jesus' name to be a representation of an ancient vision of God's feast for all peoples;"